There’s trickery afoot in the Magicious slot by Thunerkick. The game focuses on a stage magician and his almost glamourous assistant. The action takes place across a standard five by three grid of symbols and there is a total of 20 win lines (10 left-to-right, 10 right-to-left). In terms of bonus features, Magicious is sorely lacking. It offers players just a single re-spin mode that can be quite lucrative but is ultimately unfulfilling. Anyway, we’ll cover all that in the next few hundred words or so. Let’s begin! There really isn’t a great deal to enjoy about this slot machine, unfortunately. We guess some people really like magic? The artwork and animations are bland. Sure, they do the job, but they don’t really add much to the whole package. Unexciting special features. We even had to include the fact that win lines run in two ways below to fill some page space in this review! Where are the free spins or second screen bonuses? Theme feels very lazy. This is even more pronounced when we consider how apathetic the designers at Thunderkick obviously were when they came up with the bonus features and artwork for the game. 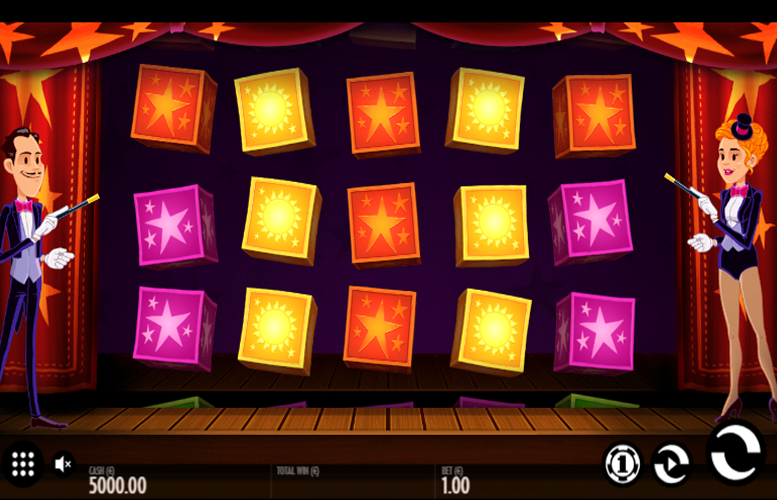 A great looking magician slot machine with amazing bonus features could be fantastic. Magicious is anything but that. Red star(yellow border) = 40x the total bet. 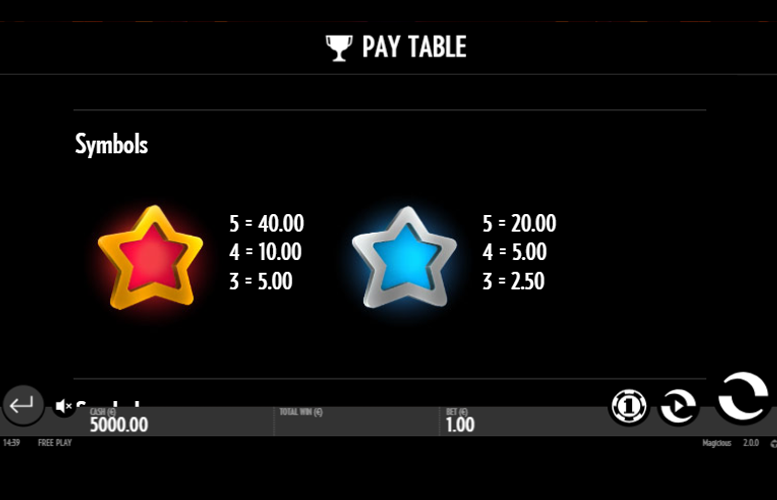 Blue star = 20x the total bet. The expanding “wild” symbol will substitute for all other symbols in the game. It will appear on reels two, three, and four only. The expanding “wild” holds the reel and triggers a re-spin of the other reels. 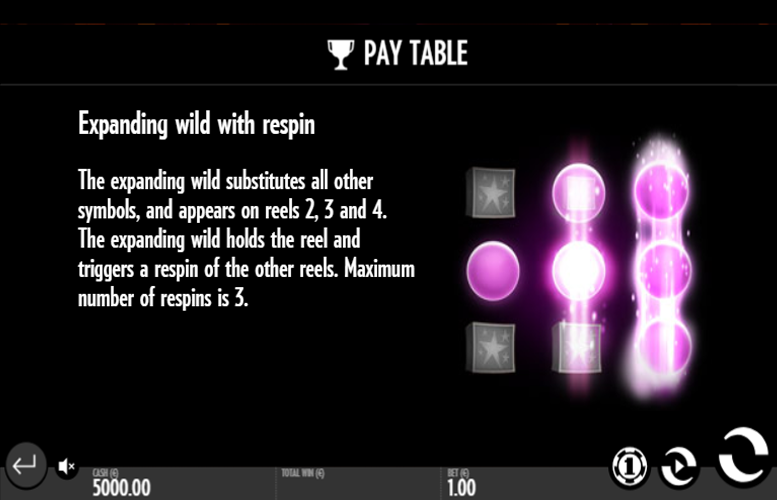 The maximum number of re-spins is three (all three reels held). 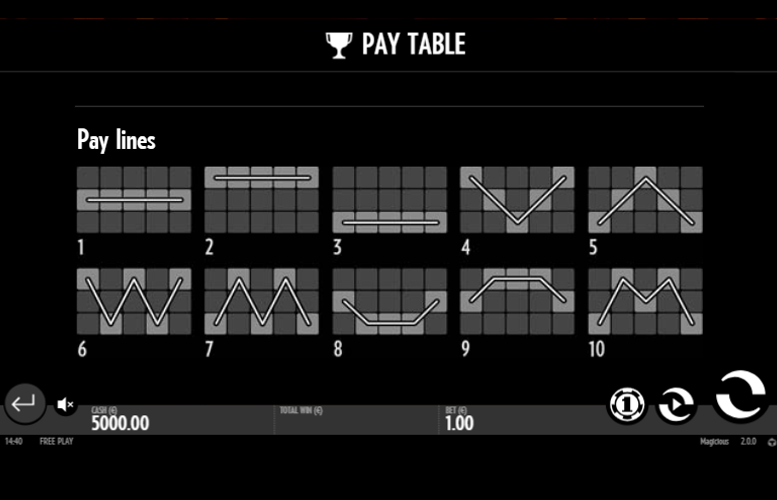 Unlike many slot machines, the win lines on the Magicious game pay from both left-to-right and right-to-left. We don’t need to tell you, this substantially increases the likelihood of hitting a big win! 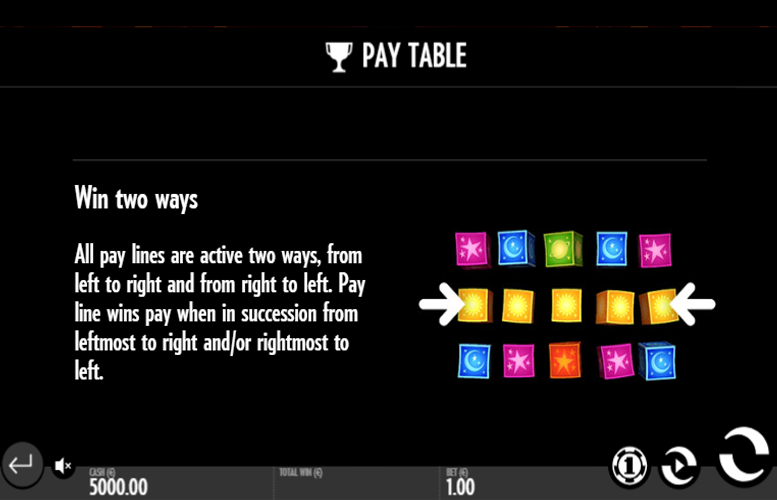 Along with the higher value symbols in the game, there are also those that don’t pay quite as well. These are represented by various coloured cosmic features. Bizarrely, Thunderkick elected to use these kind of abstract symbol designs rather than illustrations of objects more commonly associated with live magic – a deck of cards, a rabbit in a hat, a magic wand, etc. Green planet = 4x the total bet. Red star = 3.5x the total bet. Pink star = 4x the total bet. Yellow sun = 2.5x the total bet. Blue moon = 2x the total bet. When designing the Magicious slot machine, Thunderkick elected to only include total bet options for each spin. Many modern online slots allow players to tinker with all aspects of how their money is spread across the reels. By contrast, Magicious feels a little lacking in this department. That said, there are a reasonable number of bet sizes and they range from very small to decently sized. The lowest is just 10p and the highest is £100. Granted, this isn’t the largest betting limit we’ve ever seen but it’s by no means the smallest either. We think all but the highest rollers should feel welcomed by these figures. As you’ve probably gathered by now, Magicious isn’t our favourite slot machine ever. Let’s summarise just what grinds our gears about the title. Firstly, the theme itself is pallid. Magic can certainly be exciting, but it will take more than two largely motionless figures awkwardly pointing their wants at the reels to get our pulses going. The theme would possibly work with a really great second screen game, an overhaul of the artwork, and some great cinematic sequences. Alternatively, Thunderkick could have ramped up the excitement by including some massive five-of-a-kind wins. However, without these features its more kids party magic than a night with David Copperfield in Vegas. The features, artwork, theme, and ultimately everything about this title let it down. Whilst none of it is spectacularly bad, the combination of hugely indifferent components combine to create a slot machine that we shan’t be revisiting anytime soon. This game has a rating of 2 / 5 with 306 total reviews by the users.